The speed limit is 5 m. p. h. in the parking lot at all times. Never park your car in the school lot and walk your child to line. If your child has a project or some other school assignment that requires your help, drop off your child first, then park your car and carry that project to your child or his/her classroom. Always pull as far forward as possible (toward the fence on Central Avenue) before stopping to let out your child. The children can make it all the way to line without trouble. Do not stop near the black, wrought iron gate that separates the church and school parking lots. Wait to turn the corner and pull forward. At no time should parents use the church parking lot for dropping off or picking up their child. 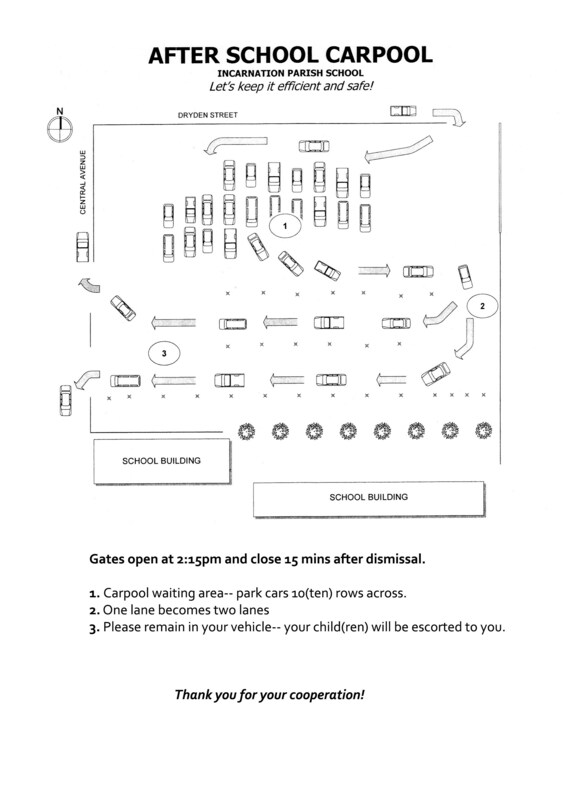 The gates between the church and school will be locked from 7:30 a. m. until the end of carpool. Do not get out of your car. Let the children open and close the car door by themselves, or a carpool lane volunteer will assist them. Do not have your child put his / her backpack, etc. in the trunk. Try having them carry it on their lap or in the seat next to them. This will prevent the children from walking behind your car, which is strictly forbidden. Never back up. Remember that the person stopped behind you is letting his / her children walk in front of his/her car. Never pass cars in the carpool lane. This increases the chances of accidentally hitting a child. To ensure that the carpool lane runs smoothly and safely, teachers may not use carpool time for discussions with parents. If you have any questions for the teacher, please leave a voice message, send an email, or make an appointment. Be patient. Everybody around you is in virtually the same situation. Be kind to the carpool lane volunteers. They are there for the safety of your children.